The First recorded evidence of Tooth Decay / Caries has been seen in this Reptile named Labidosaurus hamatus or the “lipped lizard” which belonged to the Permian geological period which was 275 million years ago. 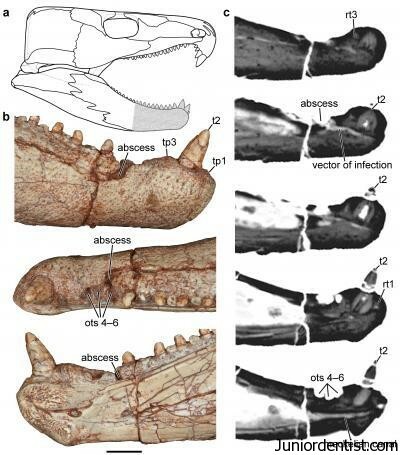 The evidence of Infection in the Lower Jaw was visible through the modern imaging technique, Computerised tomography (CT Scan) which has shown evidence of an Extensive Abscess in the lower jaw of the Lizard which a native of the now United States in the Lower Permian period. The Infection was extensive and Dentists are suspecting it to be a suspected case of Osteomyelitis of the Lower Jaw. Which might have lead to Severe Dental Pain, Loosening of teeth and even Loss of teeth in the region of infection. This is the first documented evidence that Omnivore reptiles have also been affected with Dental infections and Dental Decays. Labidosaurus hamatus is a result of Evolution which has changed the dentition, where teeth were loosely attached to the Jaw and were constantly replaced, but in Labidosaurus hamatus we can see that the teeth are firmly placed inside the jaw much like our present dentition pattern. Hence the history of Dental Problems and infections dates back to a very long time millions of years back to be precise, as all animals needed teeth to chew and eat food.